The tips quivered all the way to the bottom just like a Senko when I tried it in shallow clear water. 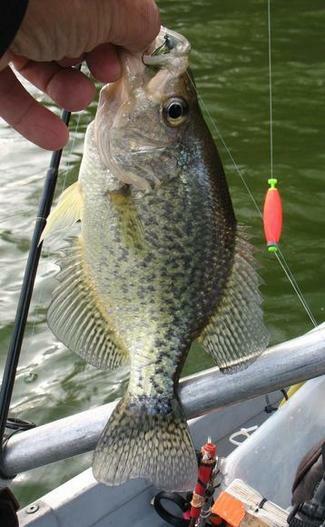 I didn't try the rig until June, but when I did, I caught crappie, yellow perch and sunfish. The presentation in 7' of water is to use the rod tip to add slight jerks to the stick as it falls, pause and repeat, working the lure at different depths. Recently I thought about using a short finesse worm with a wacky rigged jig and dang if it didn't catch panfish and bass. Note: The lures don't sink as fast as a Senko due to the plastic, so a jighead is necessary to start a fast fall to the bottom and for casting distance. Pretty much any 3-4" thin finesse worm will work and in open water as much as when beating the bank. Great idea, are you mainly fishing from shore when you use this, if so, how do you cast it out very far with such a light rig? That seems a feasible idea to work with. Plastic has weight and you'd be surprised how far you can cast lures - even those rigged on 1/32 oz jig heads. The other method of obtaining a good distance is using a foam float and is great for presenting lures very slowly while still covering water far from shore. A bud of mine showed me that trick! I see you are in a float tube or Kayak, so that helps but a weighted bobber helps a bunch too. I know you can get some extra casting distance by using braided small dia line but I was thinking you were just casting those small jigs by themselves. Thanks for the reply. I was thinking you were just casting those small jigs by themselves. I do and get a nice distance of around 30' or more using 8# test braid or 6# test Trilene XL mono for some spincast reels. This includes using 1/32 and 1/24 jig heads plus plastic weight. 30 ft isn't bad for jigs that small but casting from a boat gives you an advantage, if you were casting from shore, do you think you would have the same success, if you were not using a float? I couldn't tell from the pic you posted what kind of craft you were using. I fish from a Lowe 10' rowboat and attach a transducer to the stern for my sonar. I only use a trolling motor. For larger waters I use a bass boat. There's no way the distance can be reached from shore without using a float - which is where the advantage of a boat comes in. More than that, the hilly country lakes I fish don't have easy shorelines to move along especially those with brush and / or overhanging limbs that prevent casts. No doubt fishing from shore has its limitations on some waters, but at least a weighted float increases the area one can cover - big time! Nice setup, looks like one I use to have, the only thing you need now is an electric trolling motor. I have two Minn Kota tms - both 45 lb thrust, one long and one short shaft. I've been using a 34 lb thrust MK because it's magnet is lighter than that of the other two. The sonar transducer isn't attached to the trolling motor. Sounds like you are all set up with those different electric motors. Do you usually use it for slow trolling while casting or just trolling without casting? No Curt, I don't troll for fish like you do, though I did catch two fish last month going from one area to another with the lure still in the water. The short shaft MK 45 # thrust I got from Walmart super cheap because someone mismarked the box - $125. I use it 95 % of the time. A friend needed cash so he made me an offer to sell me the long shaft 45# thrust MK for $100. Couldn't pass that up as a b/u! The reason I ask is because we started doing a modified troll this year or as we call it a slow troll, using our electric trolling motor. We have been doing it for catfish with jigs calls Fligs, that TubeDude makes, they are floating jig heads. We put a weight on the line to get the jig down to the bottom, then a piece of leader about 12 to 18" long so the jig floats above the bottom. We troll at .4 to .6 mph, so pretty slow but it seems to work well and it also works for other fish like perch. I'm going to try it tomorrow with one of those beetle spin jigs, just to see what happens, I'm hoping that extra flash from the blade will bring them in but we will see. Sounds like you got some good deals on those MK motors. I used those for years until I upgraded to a bow mount electric, not I have one with I pilot, sure makes fishing a lot easier, at least for the way I fish. Sounds like a modified Carolina rig. I might have to try it. Here is a pic of some of the smaller ones, they come in several different sizes. They look like ice fishing jigs. Yes but they float, here are some larger ones we use for cat and perch fishing. Perch and catfish strike them on the surface? Those are two of the three sizes they come in, still looking for the pic of the size I use for cats and perch but the way we fish them is to put a 3/8 to 1/2 oz weight on a Swivel Snap, then put a leader about 12 to 18", tied to a flig on the same Swivel Snap. We put cut bait on the flig then just drag the weight on the bottom and the flig with the bait raises above the bottom, so it supendse about 12 to 18". 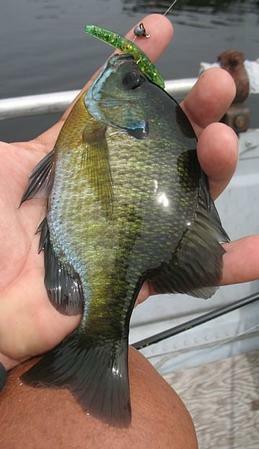 As you slowly move along, you cover the area you are fishing until you find some active fish. We mainly use this method on semi rocky or mud bottoms, not sure how well it would work on a really mossy bottom. 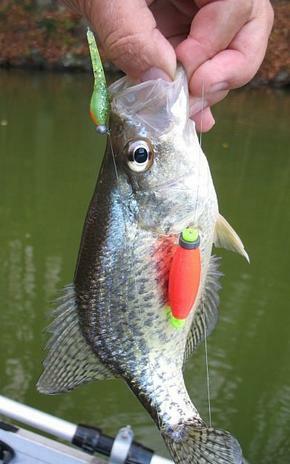 So the Carolina rig is what gets the lure to the bottom and allows a suspension. I have some floating jigs that are over 15 years old and never knew how to use them. Thanks for showing me! A Flig is what is in the attached pics above, they are floating jig heads. I was hoping Pat(TubeDude) would chime in here about them but he makes them out of a dense foam, on a hook, then he paints them in colors that seem to work really well, especially Firetiger. On Fri, we had our best luck using Firetiger, of the 15 cats and 1 SMB that we caught, all but two came on the Firetiger, purple is another good color. One of the best things about BFT is the sharing of ideas and methods, I think we all learn from each other and it helps us all be better at doing what we love, fishing.